People I Want To Punch In The Face Notebook - Moar Stuff - You don't need it but you know you want it. 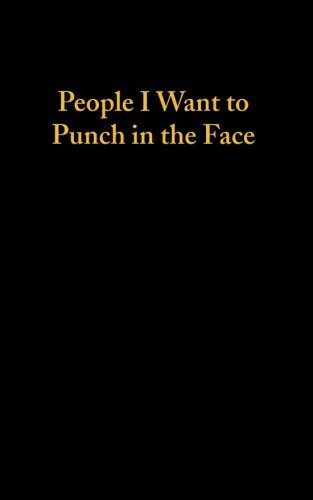 The People I Want To Punch In The Face Notebook is perfect for those of us with too short of memory to remember all of those people who so desperately need a good face punch. If you’re constantly surrounded by idiots or incompetence, you’ll know what I mean. This college ruled 5 x 8 inch notebook is the perfect size for your “list”. It sports bold gold print on a soft, matte finish cover and fits in your pocket. Keep it with you and keep everyone guessing whether or not they’re listed in your journal of People you Want to Punch in the Face. It’s great for general note taking and doodling. You’ll always get a stare (and probably a smirk) when you pull it out to write something down. You could also keep it on your desk for your annoying cube mate to see. Maybe he’ll finally get the hint and stop doing that thing he knows pisses you off to no end? It would also a great gag gift for your co-workers with anger issues. Dimensions: 5 x 0.3 x 8 inches.